1 The participating countries - Canada, United States, Mexico, Chile, Peru, Japan, Vietnam, Malaysia, Singapore, Brunei, Australia and New Zealand - have finalized and signed the text of the agreement, but the treaty must be ratified in all of them before it can come into force. 2 Peter Petri, Michael Plummer and Fan Zhai (2012). “The Trans-Pacific Partnership and Asia-Pacific Integration: A Quantitative Assessment”. Policy Analyses in International Economics 98, Peterson Institute for International Economics, Washington, DC. The Peterson Institute study has also been criticized by others, e.g. 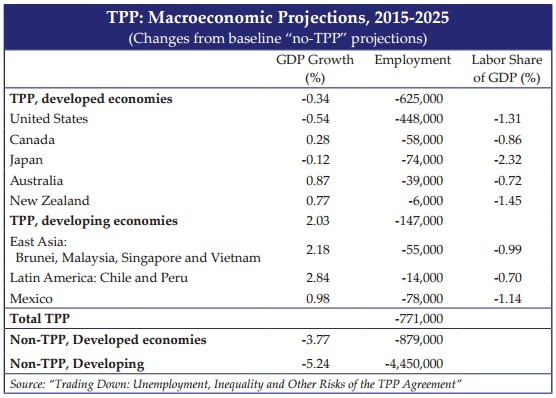 http://www.sustainabilitynz.org/wp-content/uploads/2014/02/EconomicGainsandCostsfromtheTPP_2014.pdf. 3 See Global Economic Prospects, Spillovers Amid Weak Recovery, January 2016, The World Bank Group, Washington, DC. 4 Peter Petri and Michael Plummer, “The Economic Efects of the Trans-Pacifc Partnership: New Estimates”, January 2016, Working Paper 16-2, Peterson Institute for International Economics, Washington, DC. 6 See, for example, Dean Baker, “Peterson Institute Study Shows TPP Will Lead to $357 Billion Increase in Annual Imports”, January 26, 2016.